Windows OS is the most popular OS but the OS needs to be tweaked for the best options and settings for smoother operations but these settings cannot be set with the default controls available with the OS, and requires in depth knowledge about how to configure the system with the settings. There are many 3rd party apps which help make our work easier like CCleaner, but apps like these don’t help tweak the OS but help in the maintenance and for speeding up the system by deleting temporary files.TweakNow PowerPack is a one stop solution for setting and tweaking many of the Windows OS operations.It got the functions neatly separated as tabs with many functions and options. 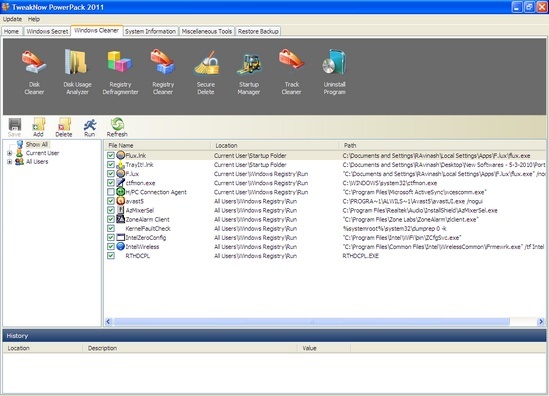 Windows Secret – This help to enable some of the deeply hidden features available in the OS related to Network, Applications, Startup, Windows Explorer [ Checkout : System Explorer – A Windows Explorer Alternative ], Control Panel, OEM Information, etc. 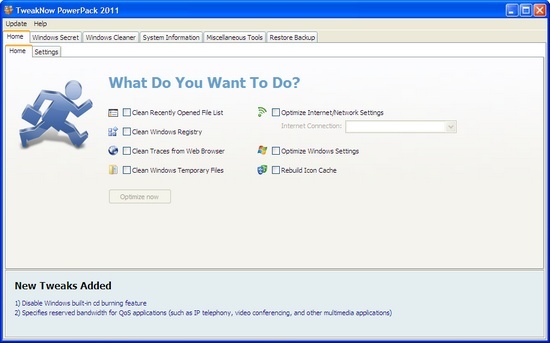 Windows Cleaner – This has options to clean junk and file from various parts of the OS, with tools like Registry Cleaner, Track Cleaner to clean the online tracks stored in your PC, Startup Manager, Registry Defragmenter, Secure Delete for securely deleting files and folders with option to choose from 4 different secure cleaning algorithms, Program Uninstaller, Disk Cleaner. System Information gives detailed technical information about your system.By Click on More information under the System Information one can see detailed information about each hard easily from the visible navigation bar with icons for each hardware.It show information like System Information, Disk Partition, Hard Disk, Memory, Motherboard, Network, Processors, Video and the OS also. 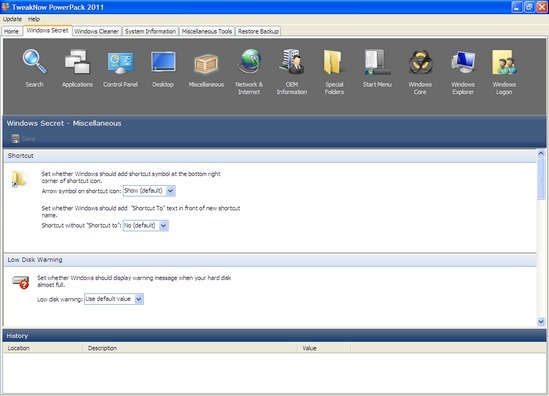 This application also has some extra features like Auto Shutdown and Virtual Desktop. 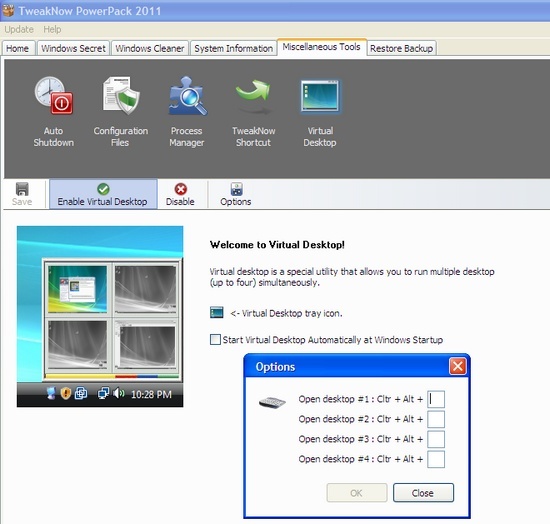 Auto ShutDown lets users schedule the shutdown of the PC after a stipulated time and the Virtual Desktop can create Virtual Desktop for easy work management.The virtual desktop feature can be set to startup with Windows OS and keyboard shortcut keys can be set up switching between the Virtual Desktops. This application deals with many important files of the OS and any wrong settings can make it non functional keeping this is sight the app also come with a auto backup feature which backups the settings as and when the user makes new changes using the app and the settings can be restored from the “Restore BackUp” tab. 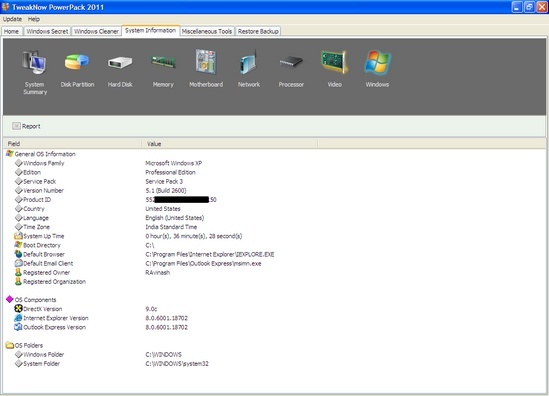 TweakNow PowerPack 2011 is compatible with Windows 7/Vista/XP.